His son’s foundation paid Trump properties using donations from another family charity. 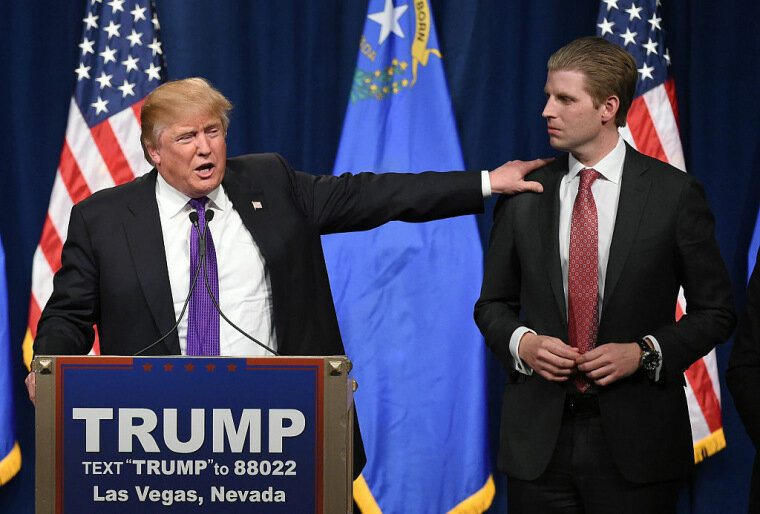 The charitable foundation of President Donald Trump's son, Eric Trump, is at the center of an explosive new report in Forbes. The magazine alleges that the Eric Trump Foundation solicited donations to benefit children with cancer, only to have portions of that money re-donated to other charities and private businesses connected to the Trump family. This movement of cash was reportedly directed by his father, Donald Trump. Such practices would be illegal under federal tax regulations and state laws against misleading donors, Dan Alexander writes in Forbes. The Eric Trump Foundation's golf tournaments were advertised as benefitting children's cancer research at St. Jude Children's Research Hospital. The events were routinely hosted on Trump-owned gold courses, properties which Eric Trump claimed he was able to use free of charge. However, filing reviewed by Forbes indicate that the Trump Organization did in fact receive payment – more than $1.2 million, which "golf charity experts" claim is an unusually high number for a single day event. In 2011, Donald Trump began billing his son Eric for the annual charity gold tournaments held on his properties. This caused documented expenses to jump from $46,000 to $142,000, according to tax filings. Just before this surge, Donald Trump donated $100,000 to the Eric Trump foundation to "offset expenses." As Donald was insisting that his son pay expenses for the event, this meant that money from the Trump Foundation ended up in one of Trump's private businesses. The Trump Foundation is a philanthropic organization run by Donald Trump. It has been accused of being a vehicle for Trump's personal enrichment, with donations going towards items like legal settlements and a massive portrait of Donald for his Mar-A-Lago Resort in Florida. The cost for the gold tournament continued to surge in subsequent years, hitting a high of $322,000 in 2015, despite Eric Trump's insistence that most of the expenses were covered for free. It's unclear why the event would cost so much. "Even if the Eric Trump Foundation had to pay the full rate for literally everything, Forbes couldn't come up with a plausible path to $322,000 given the parameters of the annual event (a golf outing for about 200 and dinner for perhaps 400 more)." In 2010, the Eric Trump Foundation's board became stacked with Trump loyalists. 9 of the 17 members "had a vested interest in the moneymaking side of the Trump empire," Forbes writes. A year later, the Foundation stopped donating money to St. Jude's and instead distributed its funds to charities – and later, clients – of the Trump family. Eric Trump claimed in December that he would no longer fundraise, citing conflict of interest concerns. However, he appeared at another golf tournament hosted by his Foundation, now renamed Curativity, in May 2017.